When you think of paradisiac beaches, it’s hard not to think of Mexico. The country has some of the most beautiful beaches in South America — not to mention the world! There are over 500 beautiful beaches in Mexico. They’re spread out across different regions, which makes them very different from one another. You can dip your toes in the Pacific Ocean, the Caribbean Sea, the Gulf of Mexico, or the Gulf of California. You’ll find that the best beaches in Mexico come in all shapes and sizes. You can choose to visit close-to-deserted beaches, beaches that are filled with tourists and hotel chains, or a mix of the two. But no matter what you’re looking for out of your holidays, Mexico is the right spot for you. Both seasoned and beginner travelers, young couples and families with children, as well as young and older people will love Mexico. Its gorgeous sand beaches and crystal-clear calm waters charm everyone who makes a trip to this beautiful country. Besides the dazzling shores, the country has many more sights worth seeing. If you’re looking for an unforgettable holiday where you can relax at the top beaches in Mexico — as well as absorb the culture and dive head-first into the Mayan culture — don’t forget to book a flight and accommodation and to see what the country has to offer for yourself! Located on the tip of the Yucatan Peninsula, Cancun is a major destination. 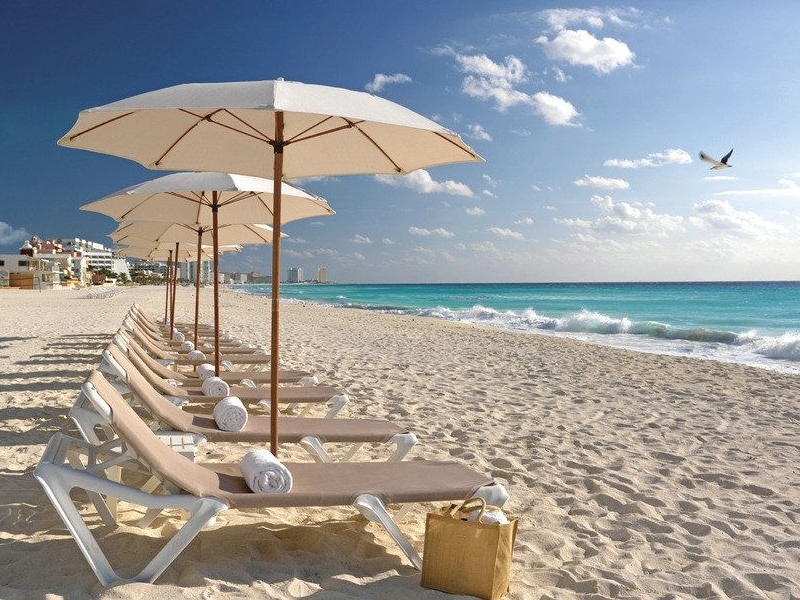 Every year, millions of tourists are drawn to Cancun Beach by the white sand and the crystal-clear waters. There are dozens of seaside five-star resorts that give visitors the opportunity to have carefree fun on this beautiful beach. The beach itself is fourteen miles long and is one of the most photographed beaches on social media. Cancún Beach is, in reality, a bundle of several smaller beaches but is referred to as just one beach by many travel guides. But the bottom line is that regardless of where you set up shop, you’ll be in for a treat. Cancún is also home to a beautiful coral reef that amazes snorkeling enthusiasts. You can rent some equipment or bring your own and set out to explore the region’s tropical schools of fish. If you like being active during your vacation, then you’ll also have the opportunity to go paddle boarding, fishing, or even kayaking in Cancún. Also, if you’re interested in Mexican culture, you can visit the Mayan ruins and other landmarks on the Yucatan Peninsula. Since this beach was once part of the Mayan civilization, history buffs and those interested in the natives’ lifestyle will be delighted to visit Cancun. Lastly, you’ll find plenty of action both during the day and at night in the Cancun Beach strip. There are hotels, bars, and restaurants all over the place. Some people even compare the hustle and bustle of some areas of the Cancun seaside to the Vegas strip! An important difference is that here, in Cancun, you’ll be able to eat authentic traditional Mexican food. 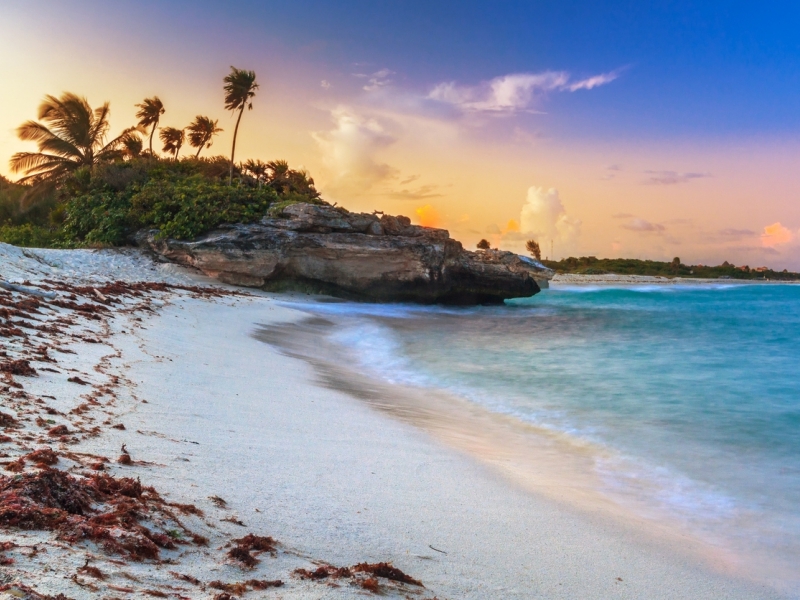 Not too far from Cancun is Tulum, one of the must-see beaches in Mexico. It’s located on the southern end of the Riviera Maya on the Yucatan Peninsula, and is best known for being a natural gem and being close to 13th-century Mayan ruins. If you’re a lover of history or a Southern American culture enthusiast, you’ll love Tulum. 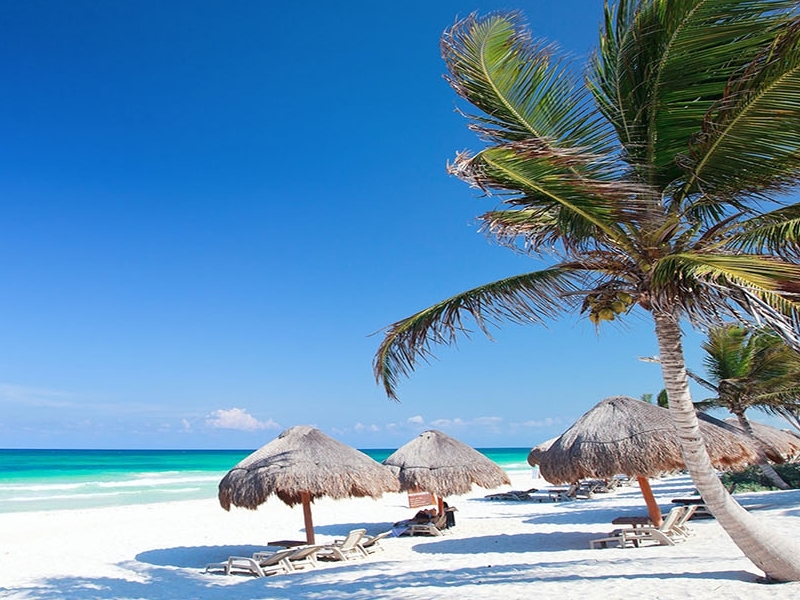 When you arrive in Tulum, you’ll be amazed at how white and fine the sand is. It truly is different from other parts of the world. The calm and crystalline waters of the Caribbean Sea are also a source of awe for visitors. When you look into the distance, all you’ll see is a never-ending turquoise horizon — the idea of heaven on earth for many. All this is tied together beautifully by the palm trees that stand tall offering beachgoers some shade. Despite being a well-known Mexican beach, it’s usually never overrun with tourists. Besides, it has kept its relaxed and bohemian vibe even though visitors have been coming here for decades. It’s the perfect place to go on a relaxing retreat away from all your worries back home. The icing on top of the cake is that Tulum has more to offer than just an idyllic beach. The strip is dotted with local, authentic Mexican restaurants and bars where tourists and locals go after a day in the sun. 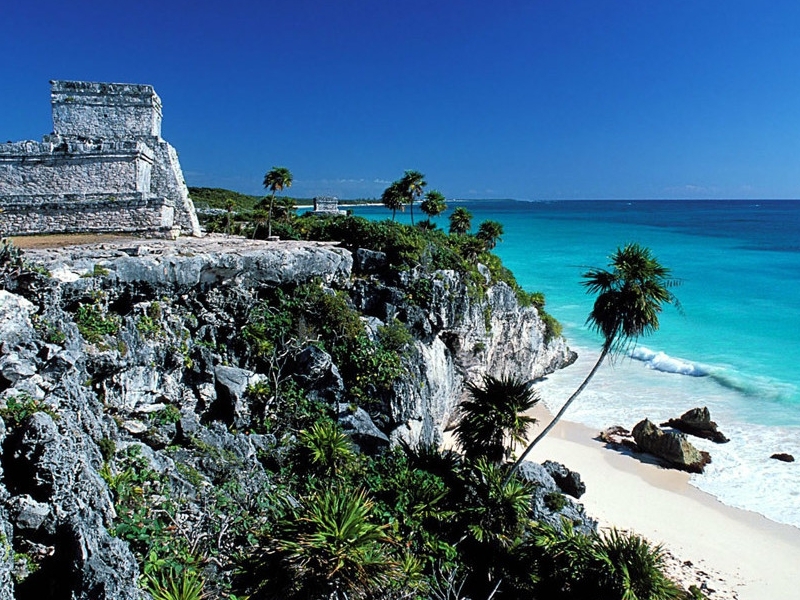 And if you’re more inclined to go sightseeing, the Tulum ruins are not to be missed! All this makes Tulum one of the most nicest stretches in the country. Located on the Pacific coast, Playa Las Gatas was named after the nurse sharks that roamed the waters many, many years ago. 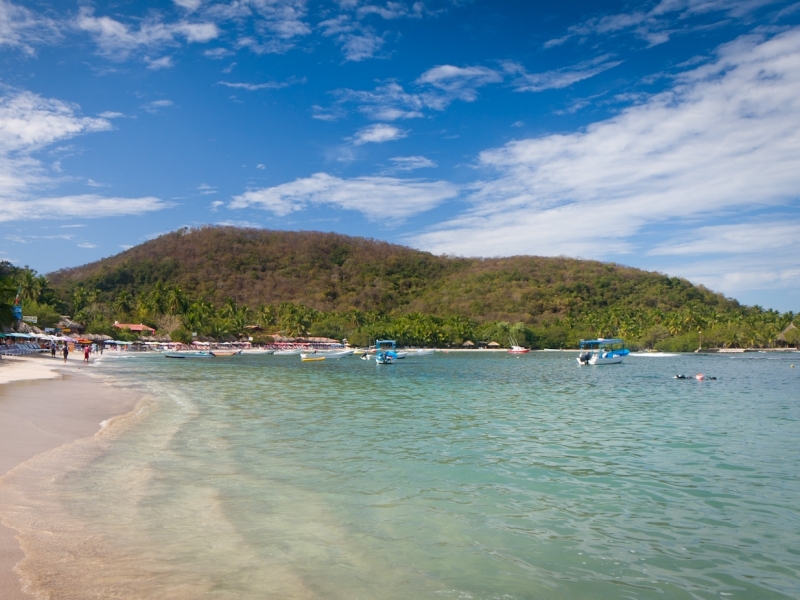 Although the sharks are no longer spotted here, the charm of Playa Las Gatas remains. If you want to reach this stunning beach, you’ll have to get on a boat or follow a very narrow and steep pathway. But it’s all about the destination and not the journey, in this case. Once you get to Playa Las Gatas, you’ll see why many people (including us) include it in their top lists of Mexican beaches. Here, the water is clear and calm with a hint of deep blue and turquoise. In fact, the nearby reef makes Playa Las Gatas a great snorkeling and scuba diving spot. If you’re a lover of tropical fish and of exploring the crevices of rocky cliffs, consider including this beach in your vacation travel itinerary. 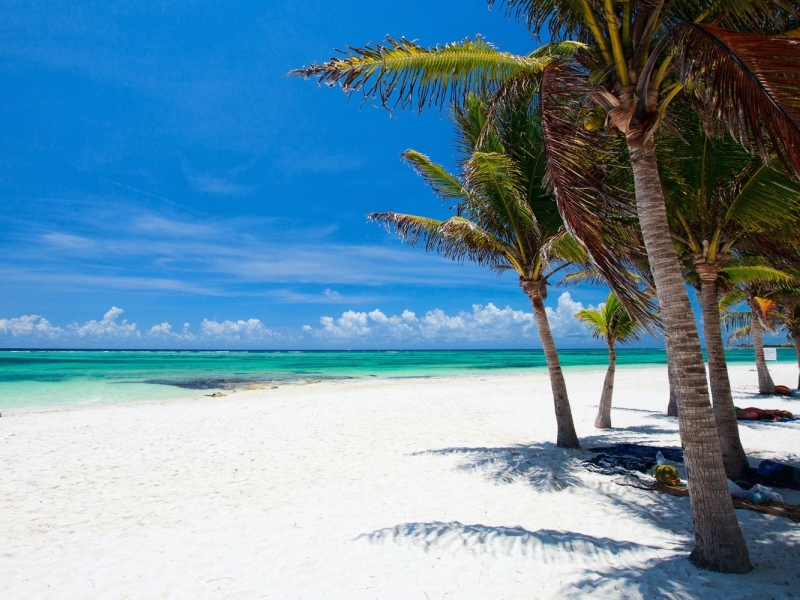 Akumal Beach is located in Quintana Roo and benefits from being on the doorstep of the warm Caribbean Sea. It’s a hotspot for locals and visitors and one of the most well-known beaches in Riviera Maya. The name Akumal means “place of turtles.” This is where thousands of sea turtles every single year without fail come to lay their eggs. If you get lucky, you might spot some of these large majestic animals making their way from the crystalline Caribbean waters further into the beach. Snorkeling lovers, as well as scuba-diving enthusiasts, will love this beach just as much as any marine biologist would. The clear waters of Akumal beach are lined in some areas by amazing coral beds that are home to dozens of tropical species of fish. This beach is also great for those who like to swim. It has five different bays where the currents are not strong at all, so even inexperienced swimmers can have fun here. It also means that Akumal beach is perfect for families traveling with children! Despite being a top-rated beach, you’re sure to find a secluded and calm stretch of sand to spend the day. If you’re looking for a resort-based destination in Mexico, look no further. Puerto Vallarta Beach is located in the state of Jalisco, on the Pacific coast of the country. It’s a notorious resort town where luxury and comfort meet tropical. 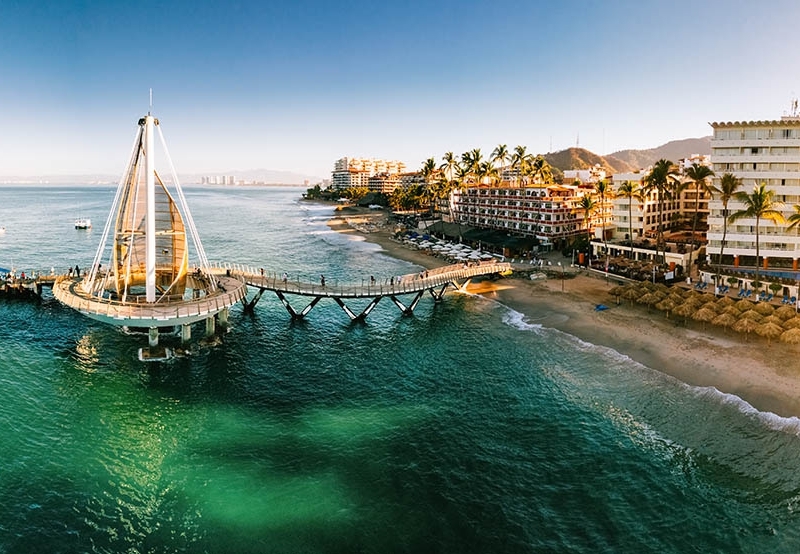 The town of Puerto Vallarta is an attraction in of itself. Its cobbled streets, traditional shops, and mouth-watering restaurants provide visitors a guaranteed day of fun. But since you’re invested in getting a tan, the beach will not disappoint you in the least. The beaches in Puerto Vallarta have plenty to offer. From deep-sea fishing to snorkeling and scuba diving, Puerto Vallarta has it all. Depending on which beach you want to go to, you’ll have a lot of activities waiting for you. You can even watch turtles swim around in the turquoise crystalline waters! Another selling point of Puerto Vallarta is how beautiful the nearby Sierra Madre Mountains look. They hug the beach, making any sunset and sunrise a sight not to be missed. 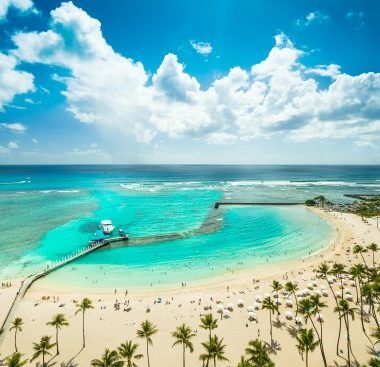 Another beach that deserves to be on the spotlight is Playa Paraíso, or Paradise Beach in English. It sits in Quintana Roo, Riviera Maya, right in the Tulum Beach area. 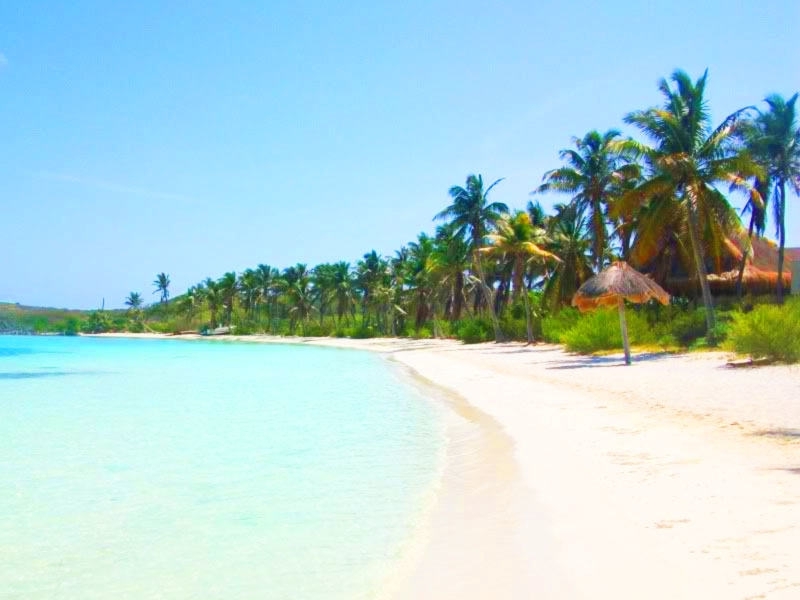 But despite being one of the many Tulum beaches, we feel like this one needs a shout out for being so — you guessed it! — paradisiac. This pristine white sanded beach is one of those places that begs to be photographed. The sculptured cliffs in the distance, the swaying palm trees, the calm and crystalline waters, and the fine sand meet to put Playa Paraíso on the map. If you practice yoga, you’ll be pleased to learn that Playa Paraíso is a hotspot for yogis from all over the world. You’ll also spot other beachgoers lounging on hammocks, enjoying the sun and breeze from the Caribbean Sea. Playa Paraíso is definitely the place to go if you’re on your honeymoon or just want to spend a few relaxing weeks lounging in the sun. Lastly, if you get bored, just take a hike to the Mayan ruins nearby. You’ll better understand the region, the customs, and the beliefs of the Mexican population! Playa Norte is a great family-friendly beach. Sitting on the Isla Mujeres, it’s an iconic beach known for its clear, calm waters and bright, shiny white sands. Playa Norte is highly sought-out by visitors and local beachgoers. And with reason! It’s one of the most stunning beaches in the country and unparalleled in natural beauty. The sand is the beach’s biggest selling point, as it is very fine and powdery, unlike most beaches across the world. Make sure to really feel how soft the sand is against your toes and fingers! Because the waters are very calm, it’s an obvious family destination. Children, even the ones who haven’t mastered swimming, can play safely in the water under the watchful eye of an adult. Even scuba divers will love Playa Norte. Here, you will find yourself at the home of the largest concentration of whale sharks in the world. If you want to see these beautiful animals up close, don’t forget to make Playa Norte one of the stops during your holiday! With all this in mind, it’s no wonder that it gets very crowded, especially on the weekends. Your best move is to arrive early and find a spot near the water. Getting to Isla Mujeres from the mainland is relatively easy. Take a ferry from the Gran Puerto Cancun ferry terminal at Puerto Juarez, a fem minutes of out downtown Cancun. The Ultramar ferry takes approximately 15 minutes to reach the Isla Mujeres, and runs daily from 5am to 9pm. Isla Holbox is a small island located three hours north of Cancun. Not a lot of foreigners know of Isla Holbox, which makes it a paradisiac nearly deserted island full of dazzling quiet beaches. You won’t find any large-scale commercial infrastructures in Isla Holbox. This means that if you’re planning on making a stop there for a few nights, you’ll be getting off the beaten track. The best thing about it is that you won’t run into large hordes of tourists itching to get the best pictures — it’ll be just you, whoever you bring along, and the untouched beauty of Mexico. The sand is white, and you’ll find lots of small seashells scattered around. The calm and shallow waters are ideal for swimming and snorkeling. In fact, Isla Holbox is one of the most famous beaches in Mexico among scuba divers thanks to the population of whale sharks that live here. Isla Holbox is becoming more and more popular among travelers who are looking for some peace and quiet in the Caribbean and South America. While it’s still far from being a tourism hotspot, the virgin beaches and relaxed feel of Isla Holbox are on the rise, popularity wise. 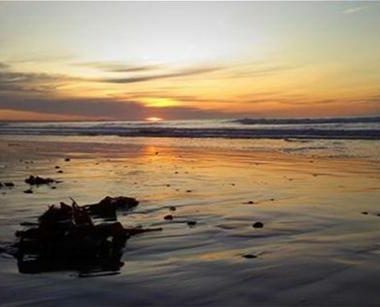 This alternative family-friendly beach destination is situated in the Baja California region. It’s washed by the chilly waters of the Pacific Ocean and much loved by snorkeling and swimming enthusiasts, as well as by families with children. The shallow crystalline waters of the Pacific coast of Mexico are perfect for swimming. Because Bahía Balandra is protected by the nearby Diamond Rock formation, the water is very calm. This makes Bahía Balandra the perfect beach for novice swimmers who want to bathe in Mexican waters regardless of their skill level. Another advantage of having rock formations to nearby is the variety of marine life. If you bring your own diving and snorkeling equipment, you’ll be able to spot several colorful species that call this beautiful beach in Mexico home. If you’re looking to stay in Baja California, the Los Cabos municipality that surrounds San Jose del Cabo has no shortage of beautiful beaches worth investigating. The main attraction in Playa del Amor is the surrounding cave with a gigantic hole in the roof that opens up the beach to the sky. There are many rumors as to why the hole is so large, one of them involving bomb testing by the Mexican government in the 1900s! 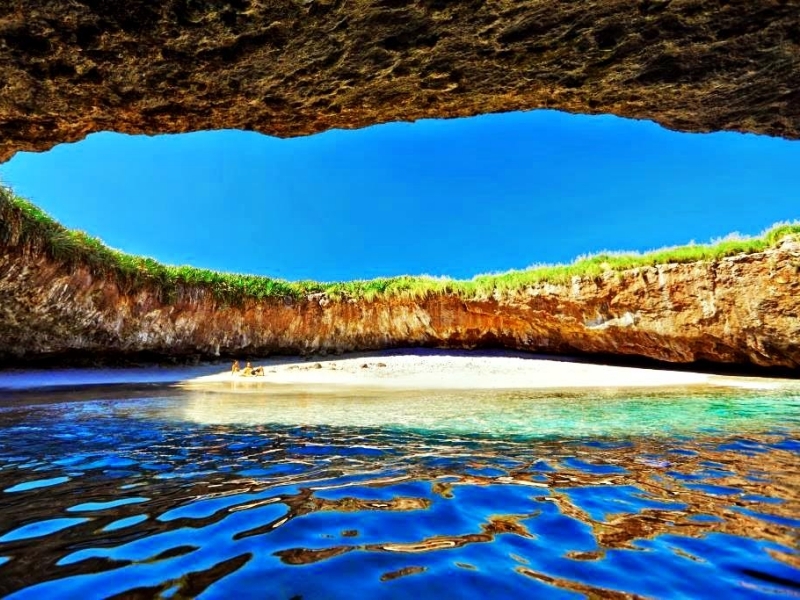 But rumors aside, this amazing place is surely one of the most Instagrammed Mexican beaches. The dramatically beautiful rock formations that hug and protect the beach make for an impressive sight. Here you’ll find plenty of honeymooning couples being swept away by the romantic feel of the beach. Because the Pacific waters can get quite choppy, beachgoers are advised to stick to the Bahía de Cabo San Lucas. 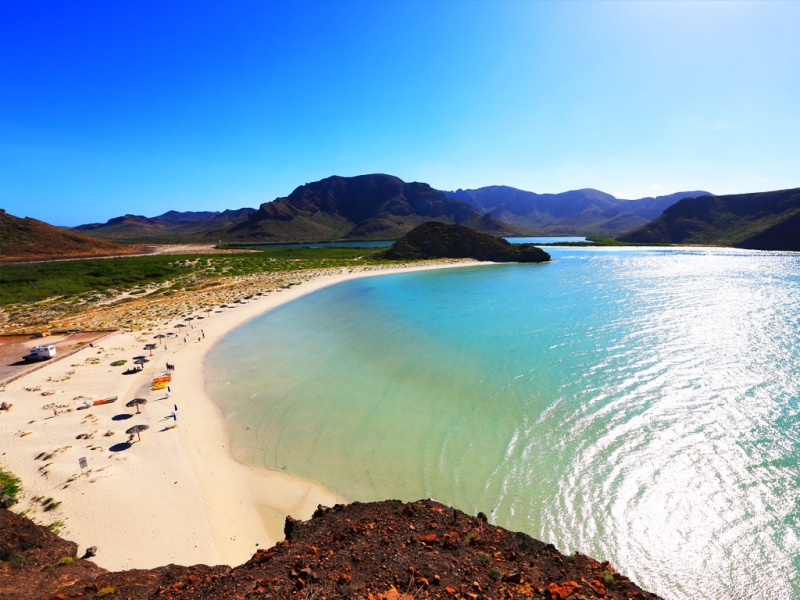 Playa del Amor is undoubtedly one of the best beaches in the country. Playa del Carmen is a beach located south of Cancún on the Yucatan Peninsula and the it’s the beach we’re choosing to close off our list. It’s almost as popular among tourists as Cancún but just as idyllic and loved. Sitting in the heart of the dream-like Riviera Maya, Playa del Carmen is a stunning beach. The fine, white sand and the blue-green waters make it an unforgettable beach getaway. Book an umbrella to sunbathe, find a vacant hammock, and doze off overlooking the Caribbean waters. But this idyllic beach isn’t just a lazy sunny stretch of coast. If you’re looking for excitement and fun activities to do while on vacation, Playa del Carmen has you covered. Here, you can practice windsurfing, jet skiing, kayaking, or even diving from the tall and dramatic Mayan coral reef. Not only that, but every year this beach welcomes Mexican and international jazz musicians to give free concerts. This is just one of the many attractive sides of Playa del Carmen, making it the best beach in the area. Yes! Mexico has over 500 beaches sprawled across its shore. Many people ask themselves “does Mexico have a lot of beaches,” and the answer to that, unsurprisingly, is of course! And a lot of variety as well. Blessed with coasts on Pacific Ocean, Caribbean Sea, Gulf of California, and on the Gulf of Mexico, beaches aren’t in short supply! Does the capital city have beaches? While the country, Mexico, has beaches galore, Mexico City has none. But this doesn’t mean that it’s not worth spending a few days in the capital! Mexico City was built more than 7.000 feet above sea-level, which makes the existence of a beach impossible. Not to mention that it’s far inland. Depending on what you want to do while in Mexico, where you should go is something you should decide for yourself. There’s a lot of variety and certainly a beach perfect for everyone. Think of whether you’re more interested in staying at a luxury resort where there are a lot of tourists or in a remote and secluded area. It’s also worth remembering that some beaches are better for certain activities than others. For example, the Caribbean beaches in Mexican waters are much more suitable for swimming than the ones bathed by the sometimes-choppy Pacific Ocean. The Yucatan Peninsula or Baja California aren’t bad places to start your research, but think of your lifestyle and what you want out of your vacation before committing to one place. Hopefully, this article will have given you lots of clues as to which beach is the one for you and whoever you’re traveling with. All of Mexico’s beaches are public. However, that isn’t to say that some luxury resorts bend the law in questionable ways to market their stretch of sand as “exclusive” or “private.” While you will find that you’re welcome on most beaches, provided you’re not drunk or disorderly, you may be given the side eye and invited to leave by some establishment owners. We’ve all seen Mexico make headlines for being somewhat unsafe for tourists and locals. The rumors are true, Mexico isn’t as safe as other countries in the world or in the region. Drug trafficking and gang violence are somewhat common but usually doesn’t affect tourists. However, that is changing a little. There have been more incidents of clashes between gangs and cartels and tourists. That said, it’s wise to use your street smarts. Avoid dangerous situations and stay out of conflicts or altercations you see going on. It’s also important to not go into deserted areas at night where criminals could be hiding waiting to rob a foreigner. Mexican beaches have a reputation for being clean — especially the ones tourists visit the most. Dozens of beaches are proud to fly the coveted Blue Flag that signals to beachgoers that everything is in order hygiene-wise and that they can kick back and relax under the scalding sun. Absolutely! Most Mexican beaches have white sand. Can you swim at the beaches? As a general rule, yes. Some areas are better for swimming than others, so keep that in mind when choosing accommodation in Mexico. If you’re not an experienced swimmer, try to avoid the Pacific coast as the waters tend to be choppier. What are the best Mexico beaches for families? Most of the beaches are totally family friendly. However, we recommend Akumal Beach, Bahía Balandra, and Playa Norte for families. Can you drink on the beach there? No, you’re not allowed to drink alcohol on the beach in Mexico. When is the best time to visit the beaches? As a general rule of thumb, the best time to visit Mexico is between December and April. This is when there is virtually no rain and the sun shines the brightest. However, because Mexico is a large country, weather typically varies from region to region. The weather in San Jose del Cabo in Baja California may be wildly different to that of Cancun on the Yucatan Peninsula. If you’re staying on the Caribbean coast, it’s important to note that hurricanes and other weather phenomena could have a negative impact on your vacation. Aim to avoid the hurricane season, which runs from June to November.